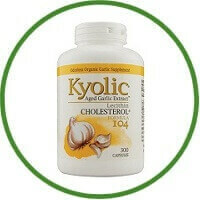 Aged Garlic Extract supports healthy cholesterol levels 1-17 and healthy nerve function 18-23 and may quench free radicals that may oxidize LDL cholesterol and damage heart tissue 24-26, Lecithin and its main constituent, choline, are important building blocks for all cell membranes. Choline is necessary to make the crucial neurotransmitter, acetylcholine; in the brain and nerves. Studies have suggested that choline and lecithin may help to maintain healthy cholesterol levels and nerves.